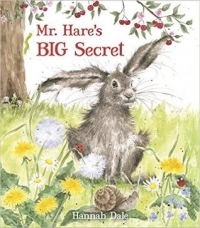 Mr. Hare has a secret: there are big, juicy cherries at the top of the tree, but he needs his friends’ help to get them down. One by one, he tricks each friend into dancing with him under the tree, until all the cherries fall to the ground and the forest friends have a great feast. Accumulation, sound words, repetition, and pure entertainment make this the perfect read-aloud book for adults and children to share. Mr. Hare is hungry, and he is sitting under a cherry tree full of ripe fruit, but he has a plan to get some of it down from the tree. As his friends all join him and ask what he is doing, he tells them that he will share his secret with them if they will join him in a dance. The animals all have different styles that are recounted as each new animal joins ("Miss Mouse jiggled, Mr. Fox trotted, and Mrs. Duck wiggled."). When enough animals are under the tree, cherries start to fall and the friends have a feast. This simple text is supported by gorgeously realistic pictures of animals frolicking outside. They are reminiscent of Garth Williams' animals, and the soft focus greenery adds cheerful color and interest to the scenes. There is a feeling of motion when the animals dance, and the different descriptions of the way they move would make this book perfect for a story time read aloud, complete with actions, due to the repetition of the words. Any fans of animal stories, from Wise Brown's Home for a Bunny to McBratney's Guess How Much I Love You will enjoy the beautiful illustrations. Those looking for books to use to encourage patterns and repetition or to use in active play related to the story will find it useful as well.